KS1 and KS2 presented a gymnastics display to many of their parents. It was wonderful to see the children�s skills, which have developed well since last year, and also to see their creativity. We all enjoyed watching the older children interpret a variety of well-known fairy tales in a physical way. Well done to all the children for earning certificates during their lessons over the year. We are lucky to have such fantastic sports facilities for us to use and also such lovely, competent instructors. What a fantastic science week we had. There was a real buzz all week with children being excited by all sorts of experiences based around the theme of �Flight�. On Monday, we welcomed Nitro Nick from Mad Science into school. He showed us some really fun experiments in assembly to set the tone for the rest of the week, and then he ran two workshops; one for KS1 and one for KS2. Each group learnt about rockets and launched one in the playground. The younger group also did some air pressure experiments and the older group learnt about jet propulsion. In the afternoon, all children from FS to UKS2 went over to the field and flew their own home-made kites. It was so much fun, the sun was shining and everyone was in a great mood. It created memories that will last a long time. On Tuesday, Jason and Wendy from Falconry UK visited us and brought a selection of owls and falcons with them. The birds were adorable and everyone was mesmorised by how cute they were. Every child had the opportunity to hold either an owl or a falcon and we learnt many facts about how they fly and how they get their food. Wednesday was another highlight, when the whole of main school visited the RAF Museum. The younger children had �Fantastic Flight� workshops, whist the older children learnt about parachutes and experimented with different shapes and sizes. Everyone loved seeing the huge variety of planes and helicopters on show at the museum and (although not surprised), I am delighted to report that behaviour from every single child was exemplary. On Thursday morning, the children spent time in their own classes experimenting with paper aeroplanes, building bi-planes and boomerangs and looking at helicopters. In the afternoon, children in preschool to KS1 took part in a carousel of activities, organised by the teachers, to further explore how things fly. It was a huge amount of fun. On Friday, we held a feedback assembly. It was an entertaining and informative session. Science week was a great deal of hard work and planning by the staff but was so worthwhile. The children enjoyed learning about flight and had some fabulous experiences. Thank you for the lovely comments we have been hearing about how excited the children are about science in general and this week in particular. On 26th June, we held our Swimming gala. The KS2 children swam in races for their houses and then a house relay, where each child swam a length with an item of clothing, gave it to their house captain who had to put in on and then swim a final length whilst wearing socks, gloves, shorts, t-shirt, armbands and a wig! The winning house was Dahl. Well done to all competitors. I was very impressed by the standard of swimming and we all thanked our instructor, Sue at Bushey Grove, for her great teaching. On 28th, we held our preschool sports day in the morning, followed by a family picnic and then the main school sports day after lunch. It was a great day, full of fun and laughter. Last year, we nearly cancelled because of rain; this year, it was almost too sunny! Despite the heat, the games and races went ahead and after totalling the points from the swimming gala, the morning and the afternoon, the overall winners were Rowling. Thank you to all members of staff who were involved in thinking of games, gathering equipment and running the events. It was, as usual, a real team effort. Our annual school fete on Saturday was a lovely occasion. The weather was amazing and the school grounds were full of exciting activities for everyone to enjoy. The choir sang beautifully and put everyone in a great mood. Thank you all staff and parents who helped out but a special thank you to Lizi (Apple room) and Tracy Hunt (chair of FoL) for organising the whole event so well. They both put in a great deal of time and effort and it is hugely appreciated. I am happy to announce that we made just over �1600. Local author, Michael Gleeson, was welcomed to Longwood at the beginning of term. He was very entertaining and the children enjoyed hearing about the process of writing books. Michael grew up in Texas and his books are full of adventures in the Wild West. Many of the children bought one of his books. We hope they will go on to read more of them. Our Talent Show was enormous fun with 19 acts ranging from singing and dancing, to musical recitals, to a Longwood tennis record and even a magic act. It was lovely to see the children enjoying themselves and so many of them being brave enough to get up and have a go. The judges had a hard time making their decisions and I didn�t envy them. Congratulations to Ahran, Khaya, Constantine, Lana and Charlie and also to Charlotte, who were awarded joint third place; to Amelia MD, Seun, Emma, Kristina and Freya and also to Kian, who were awarded joint second place; and to Sara and Amaya who were our joint winners. Thank you to Mrs Bointon and Mrs Sangster for judging and to Amelia H for organising the event. At the beginning of March, we celebrated World Book Day. Along with various assemblies and book related activites, we held a book fair. Children and adults bought a wide variety of books at great prices. There really was something for everyone. The children enjoyed some shared reading sessions with their parents, but of course, the highlight of the week was dressing up as a favourite book character on the last day of the week. There were some wonderfully creative home-made costumes and, even in the snow, it was great fun trying to guess who everyone was supposed to be. On 14th March, our school choir took part in the regional Music for Youth festival. We were amongst the 40,000 children participating this year nationwide. It was a wonderful opportunity to perform to a real audience in very impressive surroundings. Our children rose to the occasion and sung (or played) beautifully. We are incredibly proud of them all. We joined in with Sports Relief again this year. At the beginning of the week, Ava and Amelia (UKS2) told everyone about Sport Relief in assembly. They had prepared a PowerPoint presentation about how the money is raised and how it is spent. They were well-prepared and very eloquent. It�s lovely to see the older children stepping up to the mark and starting to make a difference. On Friday, we all enjoyed dressing up in red or in sports kit and raising money for Sport Relief. There were fun and games on the playground mid-morning and a great competitive feel with everyone having fun along the way. What a great way to raise money for a good cause. On 12th January, we were delighted to welcome Oliver Dowden to Longwood. He is our local MP and represents Hertsmere at Westminster. He was promoted in the government reshuffle on Tuesday and is now a minister. Our KS2 children asked him a variety of interesting questions, ranging from his daily routine to whether he aspires to be Prime Minister one day to if he has met the queen. After his talk, Kristina and Max gave him a quick tour and he particularly enjoyed meeting some of our nursery children. Later in the month, a representative from �Perform for Schools� visited Longwood and led two workshops � one for FS and one for KS1. The children�s imagination came alive and they learnt some improvisation techniques as they went on a journey round the solar system. It was lovely to see every child joining in with enthusiasm and creativity, and the sessions were thoroughly enjoyed by all. On 6th and 7th, the FW and FT parents were treated to a fabulous nativity. It was fun and the children performed beautifully. It takes a great deal of hard work from the staff team to prepare the children for such events and my thanks go to them all. On 11th, it was the turn of FS and KS1 to perform their Christmas show, Gnome Alone, to a full house. They were fantastic. The audience was blown away and the children enjoyed it immensely. As always, I marvelled at how well they acted and sang and how well the staff team had prepared them. After school the same day, drama club put on a low-key performance of A Rhyming Christmas Carol. Yet more costumes, props, words learnt and dances were on show and it was a great success. Tuesday saw all the children from Reception to Year 6 go off to watch Aladdin (oh yes they did) at the Alban Arena. It was great fun and, as always, the children behaved beautifully and were a real credit to Longwood. On Wednesday, the Christmas celebrations continued with Christmas lunch. The school council reps had requested a festive meal of chicken nuggets and potato wedges and this was followed by Christmas cookies, baked by children who had entered a competition run by the school council. There was a fantastic array of cookies and it was hard for the judges to choose an overall winner. Originally, they had decided to pick three winners. Eventually, they settled on eight! Congratulations to Rocco, Constantine, Sophia T, Niam, Arthur, Paige, Lauren and Jason, whose cookies were voted the best looking. After lunch, we had an afternoon of fun, consisting of an inter-house Christmas quiz, Christmas �Name That Tune�, a paper chain race and a poetry recital. Well done to Rowling house who were the winners. On Thursday 14th, UKS2 performed The Peace Child to another packed house. It was a fantastic performance and a great team effort. How the children learn so many words, take on such bold characters and keep cheerful is amazing. Well done to everyone concerned, especially the staff team. On 24th, we held our Musicians� Assembly. There was a fantastic array of talent on show. The children had practised hard to show off their skills and the audience was not disappointed. The massed ensemble (choir, keyboards and various musicians) performed Mamma Mia and we had many individual performances too on a variety of instruments. A huge thank you to Mrs Sangster for masterminding this event. Photos are on the website, so please take a look. Bingo Night was a huge success. Apart from raising �427 for school funds, which is a fantastic achievement, the evening was immense fun, with parents and children all enjoying using their dabber pens and winning prizes for corners, lines and full houses. The raffle was a highlight too. We ran a homework workshop for LKS2 parents. This was an opportunity for everyone to understand homework tasks and how best they can help their children at home. I hope that everyone who attended enjoyed it and felt that it was worthwhile. KS2 visited the Beaumont care home in Bushey. We entertained the residents with a medley of harvest songs and then spent some time chatting with them and enjoying their company. It was such a lovely experience for our children and one that we will definitely be repeating. We have already been invited back before Christmas. Another highlight was our harvest festival, which took place at St James� Church in Bushey. All of the children performed beautifully and the parents were treated to poems, songs and even a Longwood harvest rap! Thank you to everyone who came to support this important event in the school year. We celebrated �Green Week� at Longwood. The week started with an assembly about why we need to recycle. You may remember that last year�s LKS2 won a �Lunch Box No Waste� award last year. A representative from Affinity Water led our assembly and awarded us with a trophy! On Friday afternoon, we had a feedback assembly, when all of the classes shared what they have learnt this week. FS sang two songs about recycling, KS1 showed us some posters about what to do with litter, LKS2 told us a story that they had written themselves about the dangers of sea pollution and how it can affect a whole array of sea life, and UKS2 shared a PowerPoint presentation about various aspects of pollution, recycling and climate change. It was a powerful assembly and really made everyone think. We held a McMillan coffee morning - Wow! We had so many cake donations. Many thanks to everyone who baked for us. Thank you too to everyone who came along and supported us. It was lovely to see so many parents meeting and chatting. Everyone agreed that there was a great atmosphere, helped by our Year 6 children who served, entertained and cleared up afterwards! We had many cakes entered into the cake competition. 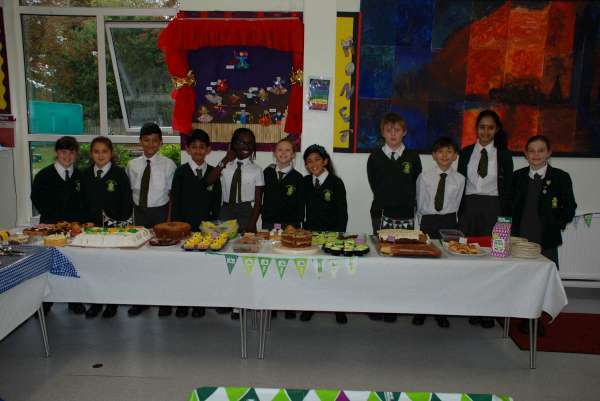 Well done to everyone, but special congratulations to Rebecca and Charlotte, whose turtle chocolate cake won third place, Rayyan, whose delicious chocolate cake won second place and to Alex, whose strawberry extravaganza won first place. Thank you to Ava and Amelia MD, our events prefects, for organising the whole event, including a most informative assembly last week, when they explained where the money goes. I am delighted to announce that we raised �368.70. What a fantastic effort, for a great cause. We held a Letters and Sounds evening at the beginning of the year. It was great to see so many parents and feedback has been that you all found it very informative.